Agate is a great gemstone for Protection, Healing and Strength. Different colors of Agate are stronger in different areas but all agates have properties in common. Historically, Agate was placed on Breastplates to protect them in battle and give them strength. Agate gives courage, emotional strength, self-confidence, and dispels fears. It is also noted as a very protective stone for children, especially with regards to falling. These protective qualities have made Agate a good luck stone. Agate enhances creativity and strengthens the intellect making it the stone of students and artists. Agate was historically it was placed in water for cooking or drinking to dispel sickness. 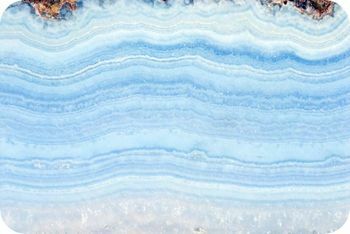 Agate is a grounding stone and brings the user into harmony with the elements. Agate is said to be particularly helpful with tooth and gum issues, stomach problems, physical endurance, insomnia. Agate can cleanse and stabilize the aura by removing and/or transforming negative energy. It has been used to heal and improve relationships. The white varieties are known as the stone of hope, it increased harmony and dissipates bitterness and resentments. The stone lessens the feelings of envy. Agate is a stone of marital fidelity. Moss Agate has been known as the crystal of gardeners and agriculture. Placed in a flower bed, it will help crops grow. It was considered a miraculous healing stone for tribal priests of the past, giving them power to interact with our human organic system, and was used as a talisman to make warriors strong and victorious. Useful as a birthing crystal, Moss Agate aids midwives in their work, reducing pain and assisting in delivery. It is a stone of new beginnings. Moss Agate is extremely beneficial as a body strengthener in times of stress. Its steady energies aid those who feel unstable or un-grounded. It is an excellent stone for convalescing after illness, or in recovery from addictions. It enhances mental concentration, persistence and endurance, making it useful as an aid in physical exercise programs, therapies, or body building.